I had a pound of kale fresh from the farmers’ market. I was very hungry and had to go to a meeting, so was wondering what I could make quickly. Now recently I have noticed that people are making kale salads which are downright delicious, so I thought, why don’t I figure out how to do that? It requires no cooking and that way I can have an instant meal … as soon as I figure out how to tame this kale. In addition to trying to figure out how to make kale salad so that I could eat it before the meeting, I was grinding einkorn berries, grinding millet and urad dal to make idli /dosa batter, and charging my camera battery so that I could take video at the meeting. Each of these things is an automated process in that all I am doing is putting things in the correct location and turning on switches. However, all that switching on and off and taking things in and out really adds up. So there was really no time to go online and search for a recipe for kale salad. Fortunately I kept munching on raw, un-saladified kale as I was doing so. This kale was not very tender. But it was all right, and kept my hunger at bay. When I came back from the meeting I ate some more. This time I noticed that in fact it left a hot spicy taste on my tongue. Wondering how kale could leave a sizzle on the tongue like that I searched online and found my way to an article on kale varieties on a site called “A Sweet and Savory Life.” Of common kale, it said and I quote, “The flavor is peppery and assertive, and can have a pleasantly bitter edge.” This describes my experience to a T. I wonder how many people can comprehend the notion of a “pleasantly bitter edge,” but that is exactly what the kale had. Yes, it was bitter, but after chopping down a leaf, I felt like having another. After several leaves though, I felt the heat on my tongue, almost as if I had eaten a hot chili pepper. Not really as intense as that, but nonetheless demanding of remedy. Urgently. I got a heaping spoon of creamy yogurt out of the fridge and let it cool my tongue. Perhaps I would not have felt the urgency quite as much if I had not been waiting to eat the Einkorn bread that had come fresh out of the oven. It was Khiyali’s first einkorn loaf. Well almost … I had planned to get the bread into the oven before leaving for the meeting but realized that I would not have time. Then I thought I could at least get it into the pan to rise and instruct her in baking it once it had risen. But 5 minutes before I had to leave, I saw that the dough had not even completed its first rising in the bowl. I did not want to disturb it because although my first two loaves of einkorn bread turned out beautifully, the later two were not quite as good, and I suspected it was because I had not been so precise in following the recipe. So I simply told Khiyali, here is the recipe, I have mixed the ingredients can you make the bread. And she did! It came out perfectly. When I got back from the meeting I was greeted by the heavenly aroma. We were expecting friends so I refrained from eating it before they arrived. When they arrived, though, it turned out they could not stay so I simply cut half of it and gave it to them and we chatted in the doorway as we so often do when they come by but cannot stay. I had hoped they could stay for some einkorn bread with hummus and a cup of tea but they were so pressed for time that I thought I should not press them, this time. A robust and nutritious stew. Warm up your winter evenings. TO COOK CHANA – Soak kala chana in plain water for 8 hours or overnight. [For a 2-hour soak, bring water to a boil and turn off the stove.]. Cook in pressure cooker for 3-5 whistles or in covered pot for 45 minutes until cooked. In a large shallow pan, heat oil. Sauté onion and garlic until translucent. In a small spice grinder, grind the coriander, cumin seed, cloves and black pepper. Add this powder to the oil and fry for a few minutes, stirring continuously. Add chopped tomatoes. Continue stirring. When tomatoes are cooked, add kale. If you pre-cook the kale for 3-4 minutes in the microwave, it will fit more easily into the pan and also allow for parallel processing. Salt to taste. With another few minutes of stirring to blend all flavors it should be done. Take care not to overcook. 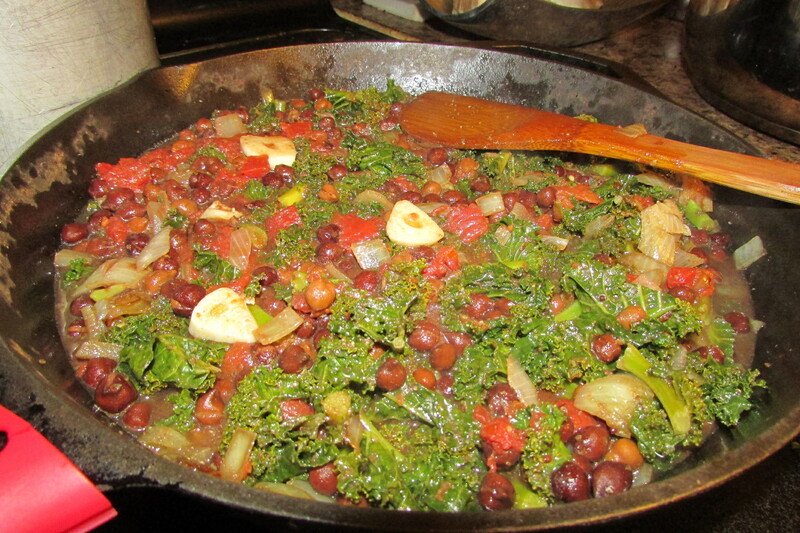 Kale Kala Chana Stew warms you from the inside out on cold winter evenings.